In 2018, Associated Artists of Pittsburgh organized 10 exhibitions of member work throughout the region? We inaugurated our 9 Artists 9 Neighborhoods video series, and we updated our website to feature both AAP organized and sponsored events and the exhibitions and projects of our members. To help us achieve our goals in 2019, Associated Artists of Pittsburgh set a year-end fundraising goal of $5,000 for our Member Programming Fund. The AAP Member Programming Fund directly supports AAP members and member exhibitions and programming. Before 2018 wrapped up, we were able to raise 93% of our $5,000 goal. Thank you to everyone who donated. All donors are listed below. Thank you, and we look forward to seeing you at an AAP event in 2019. Scroll down to read about AAP in 2018. Artist Peggi Habets discusses her work in the AAP exhibition I See You held this past spring. In 2018, AAP organized ten exhibitions throughout the region. We exhibited over 440 works of art by regional artists. We held exhibitions in Lawrenceville, Southside, Bloomfield, downtown Pittsburgh, and more. We installed work by regional artists in the Office of the Mayor and out at the Pittsburgh Regional Airport. Our 2019 schedule is up, and we have 8 member exhibitions on the books for the year ahead. Support AAP in 2019 by donating today. 2018 New Member Nation Jalil discussed the decision to become a full-time artist and the role AAP plays in his careerin Pittsburgh. In 2018, Associated Artists of Pittsburgh also debuted the 9 Artists 9 Neighborhoods series. We partnered with Pittsburgh Community Television to produce a series of videos featuring AAP member artists in the spaces and places where they worked and called home. The videos premiered online and on television, and, with your support, we hope to continue this series in 2019. 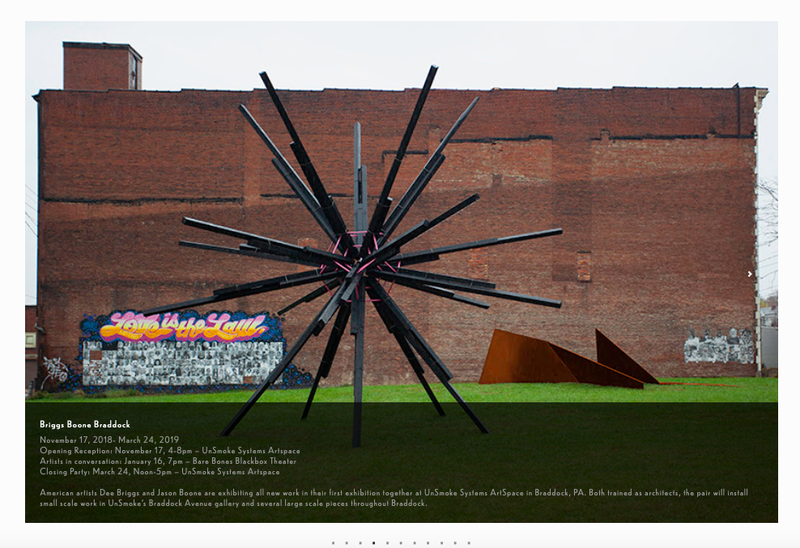 Member Dee Briggs exhibition Briggs Boone Braddock as it was featured on the Member Happenings page of the AAP website. In July 2018, AAP relaunched our website. The update features current exhibitions, a list of recent previous exhibitions, our upcoming schedule of exhibitions, a member happenings section, and a list of artist opportunities. In 2019, we will debut a brand-new membership portal and database. Our members will be able to upload recent artwork, pay dues, and learn about AAP events. Our visitors will be able to search and browse our members through a much more robust platform. Students touring a Mattress Factory installation in 2018. Now in its 28th year, our VACOP program continues to connect high school students with local artists for discussions on professional pathways and careers, as well as artwork creation. In the 2017-2018 school year, students worked with Ashley Cecil at the Carngie Museum of Natural History on botanical illustrations, visited the largest ceramic arts conference in North America (the National Council for Education of the Ceramic Arts), and toured the Mattress Factory where they participated in a workshop on installation art. Artist member Lillian Henius paints outdoors. Date unknown.